What dose of Tylenol (acetaminophen) and Motrin/Advil (ibuprofen) do you use for your family? Do you give both together? What temperature do you give these fever reducers? We do use both acetaminophen and ibuprofen in our home. I usually calculate doses based on our child’s weight. We do not use acetaminophen until our children are at least 2 months old. 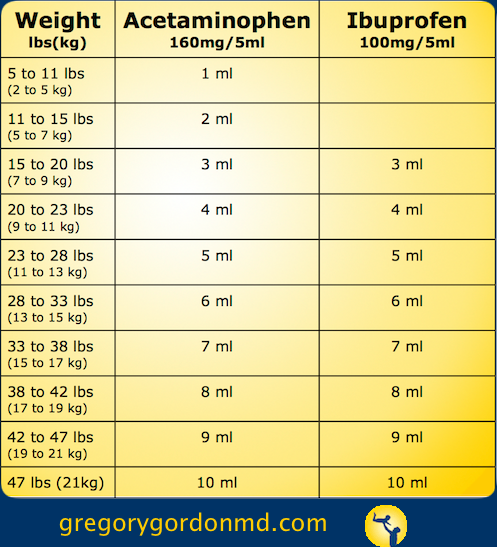 I use the standard 15mg of acetaminophen per kg dose for our children. I dose acetaminophen every 6 hours. We usually give their first dose at 2 months prior to their 2 month vaccinations. Ibuprofen (Motrin / Advil) is not approved for use in children under 6 months old. Ibuprofen is dosed at 5 to 10 mg per kg every 6 hours. 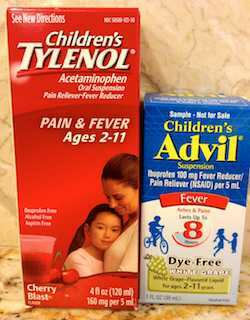 I recommend that parents purchase only the 160 mg/5 ml Tylenol (acetaminophen) and the 100mg/5 ml ibuprofen. These two medication concentrations can be dosed the exact same. This system avoids confusion and therefore prevents inaccurate dosing. Using these doses and concentrations a table can be derived. I agree with the rule “treat the child, not the fever”. If one of our children has a 102 degree fever and is running around (acting well), then I would not give a fever reducer (acetaminophen/ibuprofen). If one our our children has a 101 degree fever and is crying and uncomfortable, I would give either acetaminophen or ibuprofen. I personally think ibuprofen works better, but we keep both medications in our home. Ibuprofen seems to work quicker and last longer. For this reason, I try to make the last dose before bedtime an ibuprofen dose. Our children often develop a fever around dinnertime. When they do we give acetaminophen then so we can give an ibuprofen dose a couple of hours later. In our home, we will give both medications at the same time or a few hours apart - as long as acetaminophen doses are 6 hours from the last acetaminophen dose and ibuprofen doses are 6 hours from the last ibuprofen dose.